Sasken Communications has a board approval to buy up to 9.45 per cent stake in the company, or shares worth up to Rs 40 crore, at up to Rs 260 a share. Better Gains. 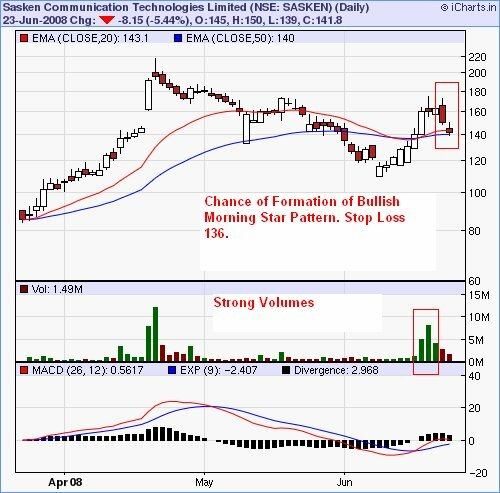 The Target of the stock may extend anywhere between 180-200.
stock was up with heavy volumes. So it the Stock moves gap up in tommorow's morning little bit then dont forget to grab this stock earlier. Please Trade this stock with strict stop in this counter. Nifty and Bank Nifty 90 min charts – Positional Shorts Nifty and Bank Nifty triggered postional charts on the 90 min timeframe with supports coming around 5447 and 10807.